Isn't she festive? The woman in this picture is obviously labled Sophie Bentley. John Charles Brennan has a great website about the Bentley family that indicates that Sophie Rebecca Bentley, born on 6 Dec 1849, was the first cousin of Ruth Elizabeth (Bentley) Tupper (I haven't verified that however). That hair, though, that hair! 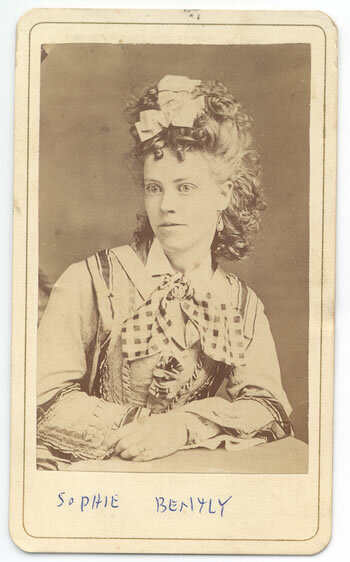 It seems to be early 1870s, which certainly jives with her early-twenties appearance, don't you think? I think the caption was written by Elizabeth's daughter Bertha Evelyn (Tupper) Conroy. On the back of the picture is the photographer's information: "Marsters, Cor. King & Germain Sts, St. John N.B." I found a Joseph D. Marsters listed as a photographer on page 403 of the Hutchinson's New Brunswick Directory for 1865-6. He was working out of the St John Hotel which just happens to be located at the corner of King and Germain Streets (except now it is completely redone and owned by Delta). I haven't found anything else on Marsters yet, although I've only checked the 1881 census. There are no other New Brunswick directories online.